Everybody wants a flat, toned abdomen, yet the presence of excess fat or sagging skin makes this hard to achieve. Even with diet and exercise you just can’t seem to firm up that area. A tummy tuck could be the answer with Dr. Kearney serving La Jolla and San Diego, CA. A tummy tuck, also known as an abdominoplasty, is a plastic surgery procedure where excess skin and fat in the abdomen are removed. In some cases, separated or weakened abdominal muscles are also restored to improve the abdominal profile. A flatter abdomen comes at a reasonable price. An abdominoplasty with Dr. Kearney costs around $6,400 to $13,750 depending on the type of tummy tuck. To determine the exact price for your specific situation, please contact us for a complimentary consultation. Financing is also available through CareCredit. They offer our patients 6, 12 and 18 months no interest plans as well as plans with terms of up to 60 months at 14.9%. Patients can finance up to $25,000. A “credit card” will be issued to you, which you can swipe in our office or other participating offices. CareCredit is for everyone. If your credit has taken a hit, you may opt for a co-signer. For more information on financing for your abdominoplasty or to apply, call 1-800-365-8295 or visit www.carecredit.com. A good candidate for abdominoplasty is someone who has excess or sagging abdominal skin. They’ve tried diet and exercise to no avail. Those who feel their abdomen is out of proportion with the rest of the body could also good candidates. The potential patient also needs to be in good overall health and have realistic goals and expectations regarding the procedure. Tummy tucks are done as an outpatient procedure with the patient under general anesthesia. Dr. Kearney makes a horizontal incision above the pubic area. The length of the incision depends upon the amount of skin that needs to be removed and the length of scarring you are willing to accept. Another incision around the belly button is usually needed to tighten the skin above it. Mini tummy tucks have one incision and it is shorter, but a mini tuck only tightens the lower abdominal skin wall. Standard tummy tucks tighten the entire abdominal wall and lift the frontal high skin. The longest incisions come from extended tummy tucks where the abdomen and sides are tightened; the incision can extend to the sides and your lower back. Dr. Kearney will discuss your options with you and recommend which procedure is right for you. He will also do his best to keep incisions and the resulting scars in inconspicuous places like below your bikini line. What can I expect post procedure? What is the recovery time? Dr. Kearney’s tummy tuck patients are usually sent home on the same day of their surgery. Patients are provided with a pain pump (a device that continuously delivers pain medication to help alleviate discomfort) to take home with them. Drains will also be present to let any blood or other fluids drain out of the incision area; they usually come out within seven to 10 days. Most patients can return to work in 10 to 14 days. 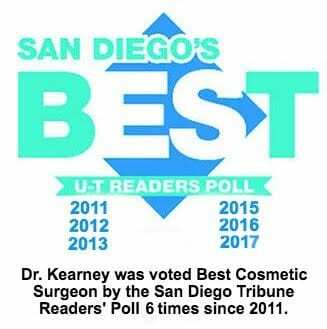 San Diego tummy tuck surgeon, Dr. Kearney, discusses his abdominoplasty procedures at his La Jolla plastic surgery practice. Call (800) 671-1951 or fill out a Contact Form here to schedule a consultation!